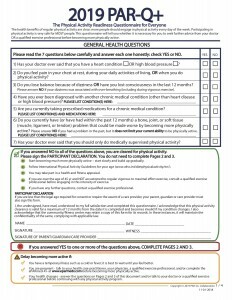 This page contains the current CONSENSUS PANEL APPROVED AND OFFICIAL versions of the Physical Activity Readiness Questionnaire for Everyone (PAR-Q+) and the ePARmed-X+ Physician Clearance Form. The new PAR-Q+ and ePARmed-X+ were introduced officially at the 3rd International Congress on Physical Activity and Public Health in Toronto, Ontario, Canada (May 5-8, 2010) by Drs. Darren Warburton, Norman Gledhill, Veronica Jamnik, and Shannon Bredin. The first peer reviewed article containing the PAR-Q+ was published in the Health & Fitness Journal of Canada and subsequent updates have been made through this journal. Owing to the evidence-based nature of the PAR-Q+ and ePARmed-X+ both forms require routine update as the evidence expands. These ongoing revisions are made by the PAR-Q+ Collaboration and evaluated by an international consensus committee. The following link contains the current 2017 consensus-panel approved version (January 2019 PAR-Q+) of the PAR-Q+. We have also created a fillable version of the PAR-Q+ for clients and qualified exercise professionals to use. PLEASE SELECT THIS LINK FOR THE FILLABLE VERSION. We will post future versions of the PAR-Q+ on this website as further evidence-based revision of these documents are made. This site is the authoritative resource for the current evidence-based and consensus panel approved version of the PAR-Q+. This is the current approved version of the PAR-Q+. Through our systematic approach and knowledge translation activities it became apparent that there are distinct differences in the terminology, understanding (i.e., health literacy), the training of health professionals (including qualified exercise professionals), and referral processes that needed to be considered in each region. As such, we have partnered with various international authorities to ensure that an appropriate, evidence-based document is available to the general population. We are pleased to highlight that various translation initiatives are underway for the PAR-Q+ and ePARmed-X+. 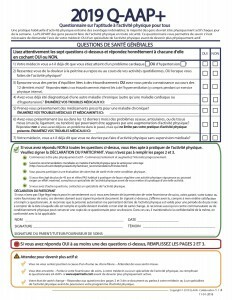 We are pleased to announce that a French version of the PAR-Q+ (the Q-AAP+ (Questionnaire sur l’aptitude à l’activité physique pour tous)) has recently been created and examined. We are indebted to the various individuals and organizations that made this possible. In particular, we would like to acknowledge the work of the Canadian Forces in the translation of the PAR-Q+ and the related ePARmed-X+. The following link contains the 2018 consensus-panel approved version (January 2019 Q-AAP+) of the Q-AAP+. The 2018 version will be posted in the near future. We have also created a fillable version of the Q-AAP+ for clients and qualified exercise professionals to use. PLEASE SELECT THIS LINK FOR THE FILLABLE Q-AAP+ VERSION. We will post future versions of the Q-AAP+ on this website as further evidence-based revision of these documents are made. This site is the authoritative resource for the current evidence-based and consensus panel approved version of the Q-AAP+. This is the current approved version of the Q-AAP+. We are indebted to our international collaborators from the United Kingdom who played instrumental roles in the development and revision of the PAR-Q+. A systematic evaluation of the original PAR-Q+ was completed in the United Kingdom (under the supervision of Kim Buxton and Elaine McNish). This evaluation has allowed for the development of English UK and Welsh versions of the PAR-Q+ and also allowed the 2012 English North American version created by our team to take on a more user friendly approach. The UK forms are currently undergoing extensive evaluation and will be posted as soon as this testing is completed. Our team is currently seeking international partners interested in translating the PAR-Q+ and ePARmed-X+ into various languages and platforms. We have a research team in place to assist with the validation of these forms. Please feel free to contact our team if you are interested in assisting with the translation of the PAR+ and/or ePARmed-X+ into other languages. The new Physical Activity Readiness Questionnaire for Everyone (PAR-Q+) and the new online electronic Physical Activity Readiness Medical Examination (ePARmed-X+) pre-participation clearance strategy reduces markedly the barriers to physical activity participation for everyone. This new strategy includes paper and online versions of the PAR-Q+ and the online ePARmed-X+. At the end of the ePARmed-X+ process, it is possible that the participant is advised to consult a physician to discuss the various options regarding becoming more physically active. In this instance, the participant will be required to receive medical clearance for physical activity from a physician. Until this medical clearance is received, the participant is restricted to low intensity physical activity/exercise participation. 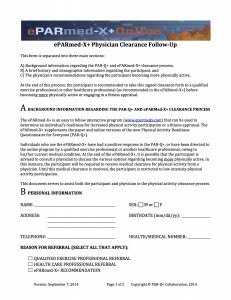 A specially designed form (i.e., the ePARmed-X+ Physician Clearance Follow-up) has been created to assists physician in the physical activity/exercise participation clearance process. The following link contains the current consensus-panel approved version of the ePARmed-X+ Physician Clearance Follow-up: ePARmed-X+ Physician Clearance Form. This form can also be downloaded at the Health & Fitness Journal of Canada via this LINK. Citation: Warburton DER, Jamnik VK, Bredin SSD, Gledhill N. The ePARmed-X+ Physician Clearance Follow-up. Health & Fitness Journal of Canada 2014;7(2):35-38.